I want to welcome everyone to the first of what will be a lot of blog entries over the course of the season. I’ve done blogs and interviews for other places before, but this one’s going to be different because it’s me — unfiltered — on my web site, done for you. It’s my way of trying to share my experience with you in a way that I haven’t before. This season began with Dale Jr. winning at Daytona, and as I said at the time, if someone else had to win, there’s no one else I would rather see do it than Dale. Dale and I are great friends, and as many of you probably know, he gave me a chance to drive for him in 2007, and that opportunity changed my life. DALE JR. IS A GOOD FRIEND AND I’LL ALWAYS BE GRATEFUL TO HIM FOR GIVING ME MY BIG BREAK IN RACING. The story of how that came to be seemed like a pretty good place to kick off the blog. Back in 2006 and 2007, I was struggling to really get a foothold in the sport. I’d been through some pretty tough escapades with different race teams, and kind of bounced around. I didn’t have any connections. I didn’t have any possessions. I had no place to live. Sometimes, I stayed in hotel rooms that teams would rent for me for a couple months while I drove for them. Other times, I stayed with friends. Every team that I worked for was broke, and we never had the equipment we needed to run well. I wasn’t really having much success. Later that season, I was down at Atlanta. I ran a truck race, and I ran terrible. But when I got in the Nationwide car, we ran really, really well. There was a part of the race where we undoubtedly were one of the best cars. It just so happened that Dale, who had his car at the time with another driver, was watching the race from his suite at the top of the track. And I passed his car. His car had a lot of sponsorships, and a lot of resources dedicated to it. We were struggling very much. But on this particular day, it was quite the opposite. We had very little resources, and we were running well. And I think he was at kind of a breaking point, so he just put that in his mental bank. MY KEITH COLEMAN RACING RIDE FOR 13 RACES IN 2007. The next week, we went to Bristol, Tennessee, and Dale, Jr. decided to run the race. He did it with his family team, DEI, but since he didn’t do it on a constant basis and they didn’t have any points, they had to park on the backside of the garage. We wound up parking right next to each other. 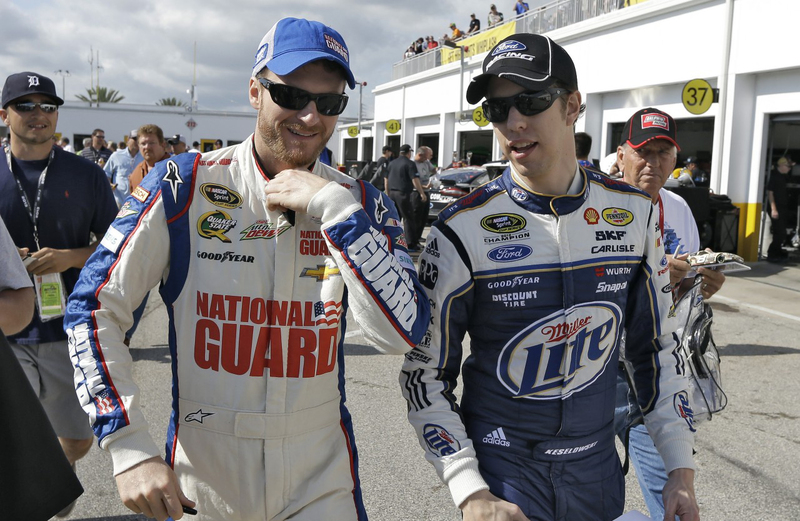 You have to remember, he was Dale Jr., and I was this struggling driver, so I didn’t want to bother him. I’m not that kind of guy — it just didn’t feel right. The funny thing was that he got out, walked over, and talked to me a little bit while we were practicing, which I thought was great. He was just down to earth. I was running really well again, and the first thing he said was that he liked the way I was driving. He said I reminded him, at least at that track, of how his dad used to drive it. He also told me, “Man I’d like to see you get an opportunity. It would be great. I wish I knew of one.” And then we kind of just moved on. It was one of those kind of “nice to meet you” situations. I struggled on for the next few months, and so did Dale and his team. 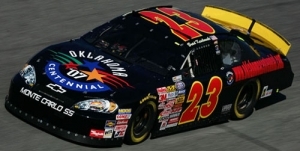 By early June, the Nationwide team I was driving for — Keith Coleman Racing — went bankrupt. I saw the writing on the wall once the season started, so I can’t say I was surprised. It was like one of those countdown clocks. I knew it was coming. I’m not going to say that it didn’t hurt, but when you’re prepared for something, it doesn’t hurt as much. I began looking for another opportunity. Something. Anything. I started spotting for someone, and I went to a truck race in Milwaukee, Wisconsin — just to watch because it’s close to where I live in Michigan, only a five or six-hour drive. There was this big wreck. One of the drivers lost his temper and had a tantrum, and he intentionally wrecked another driver. At that time, it was a big faux pas in racing. (It’s funny how times change. It seems like that happens now two or three times a year.) So NASCAR booted him out, and sat him down. Like I said, I had been at that race just watching. The team driver for the guy who had gotten in trouble — he’d seen me drive before, and he had said the same thing to me that Dale had: “If there’s ever an opportunity, I’ll be there for you.” You sometimes think those words are lip service when you hear them. You never really know. Well, sure enough, there was an opportunity, and he made the most of his word. His team, Germain Racing, called and asked me to drive that truck while the other driver was suspended. That driver was only suspended for one week, so essentially, I had a one week trial. That race was in Memphis, Tennessee, in June of 2007. It turned out to be one of those unique weekends where the stars align in a lot of different ways. Dale’s Nationwide team, like I said, had been struggling. So he had a sit down with his driver, and told him, “Look, no more wrecking. I don’t care what you have to do, no more wrecking.” The same weekend I was driving in Memphis, Dale showed up in New Hampshire to watch his car run, and when he got there, they had wrecked at practice. He made the decision right then and there that he was going to fire his driver. The responsibility, the pressure of being with a well-funded team — especially one that’s owned by the most popular guy in the sport — those things kind of hit you like a truck. I brought a suitcase and that was it. A suitcase on a plane. I landed in North Carolina, and there was a gentleman picking me up. His name was T.J. Majors, one of Dale’s best friends. He’d turn out to be my best friend. (He’s now Dale Jr.’s spotter, and he spotted for me in the Nationwide Series as well.) T.J. took me over to Dale Jr.’s guest house, and that was where I stayed for the next six months. It was a surreal thing to go through. There were a lot of benefits, obviously, to driving the No. 88 for Dale, and having resources and opportunities that you’ve never had before to be competitive. But you start to realize quite quickly that there’s other things that come with it. The responsibility, the pressure of being with a well-funded team — especially one that’s owned by the most popular guy in the sport — those things kind of hit you like a truck. You think it’s just going to be easy. “Now we’ve got a fast car, and we’ll win.” But then other things pop up to make it difficult. The pressure was to run well, not wreck and to be a leader on a team that needed one — that’s really hard to take up overnight. 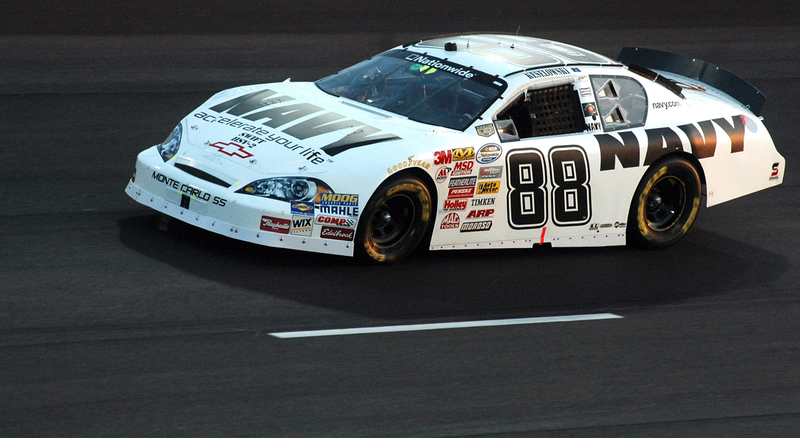 JOINING JR. MOTORSPORTS AND GETTING TO RUN THE 88 CHANGED EVERYTHING FOR ME. Things came together for me in Texas at the very end of 2007. The team had built a brand new car. We started at the back because of some kind of issue they had getting through tech, so I had to drive through the field, which was kind of one of those things that sticks out as being a huge accomplishment. I finished sixth. That was the first time we really ran well. I was very proud of that one. I think the team really rallied behind me. There’s a story about the explorer, Cortes, that comes to mind when I think of my early career. When Cortes sailed to the New World, he came with a bunch of ships. And when he landed, he burned them all so that nobody could go back. Nobody could talk about leaving. Nobody could think about leaving. They were committed to what they were doing whether they believed in it or not. They didn’t have a choice. That’s kind of where I was at with racing back in 2007 before meeting Dale, I wouldn’t say I didn’t believe in myself. But I would say that I didn’t have a choice but to make it.